Zwolle is the capital of the province of Overijssel. With about 110,000 inhabitants, the city is situated on the Zwarte Water, a small river which falls into the river IJssel. In 1230 the bishop of Utrecht granted Zwolle city rights. Zwolle was founded around 800 A.D. by merchants from Friesland from the North and troops of Charles the Great (Charlemagne). The name of Zwolle has its origin from the word Suolle, which means "hill". It was situated on a hill between the three rivers surrounding the city, the rivers IJssel, Vecht, and Zwarte Water. This was the only area that would remain dry during the frequently occurring floodings of the rivers. Approaching the city centre from the train station, we observe the Sassenpoort, an old Gothic gateway of brick, with four towers, to the right, beyond the broad Stadsgracht (canal), which is surrounded by fine trees. In the Grote Markt rises the spacious Grote of Sint Michaëlskerk (Church of Saint Michael), build in 1406. The Roman Catholic Onze Lieve Vrouwe ten Hemelopneming-basilica (Our Lady Ascension basilica), build in the 15th century, in the Ossenmarkt, has a massive tower, 298 ft. in height. 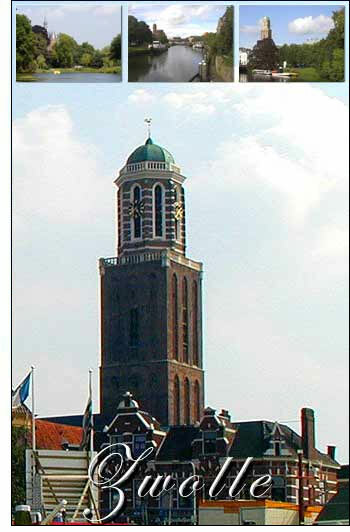 The tower, called the Peperbus (pepperbox), is one of the tallest and most famous church towers in the Netherlands. Closeby to the East, in the Melk Markt, is the Historical museum, in a private mansion of the 16th century. Zwolle was in the 14th and 15th century, with the city of Deventer, one of the centers of the Brethren of the Common Life, a monastic movement. Nearby Zwolle, on a slight eminence called the Agnietenberg (hill of Saint Agnes), once stood the Augustinian convent (monastery) in which Thomas à Kempis lived for nearly 64 years and died in 1471. Thomas à Kempis or Thomas van Kempen was the author of "De imitatio Christi" (Imitation of Christ), this book is after the Holy Bible the most translated and sold book in the world. The relics of Thomas à Kempis are situated since 2006 in the Onze Lieve Vrouwe ten Hemelopneming-basilica (Our Lady Ascension basilica). Besides the Grote of Sint Michaëlskerk, The Roman Catholic Onze Lieve Vrouwe ten Hemelopneming-basilica (Our Lady Ascension basilica) and its church tower, the Peperbus (Pepperbox) there are several other historic monuments in Zwolle. The Sassenpoort is one of the oldest city gates dating from the 15th century, the old city walls, the Mosterdmakerstoren (at the Mosterdmakerstoren mustard used to be made), the old town hall built in 1448, a guild-house (1571) and a Dominican monastery.